Jack Longmate helped organize a legislative forum that included a PowerPoint presentation [click to download] or view a Flash presentation. Start planning for Campus Equity Week, a week of coordinated campus activities designed to educate our campus communities, the public, and policymakers, about contingent academic employment issues. Campus Equity Week (CEW), often called Fair Employment Week (FEW), will be October 22 to 28 in Canada and October 29 to November 4, 2007, in the United States and Mexico. What is Campus Equity Week? Campus Equity Week is coalition among faculty organizers and organizations throughout higher education. We are joined by a common focus on the increasing and exploitative contingent employment practices in our colleges and universities, and the problems deriving there from. Whether an individual or organization's specific attention is on academic quality, student access and success, public policy, fiscal support, working conditions, benefits, or pay equity issues, we generally agree that what has been termed "the corporatization of higher education" has led to a continuous decline throughout the last half of the twentieth century, and this following on a half century of unprecedented growth in all measures of quality. Washington State Governor Proclaims "Adjunct and Part-time Faculty Recognition Day"
Washington governor, Christine Gregoire has proclaimed October 31, 2007, "Adjunction and Part-time Faculty Recognition Day." 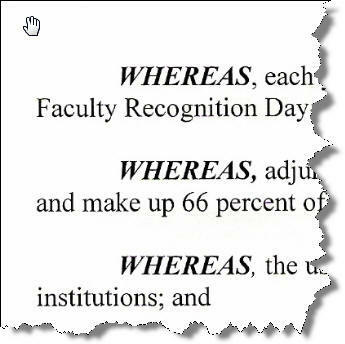 The proclamation recognizes that contingent faculty "teach close to 50 percent of the classes and make up 66 percent of the teaching faculty" at two-year colleges. It also recognizes that contingent faculty "bring a multitude of talents, skills, and areas of expertise" to their teaching. Contingent faculty campaigns take place on several terrains including the legislative arena. Several online resources are available. For an overview, see Keith Hoeller's "Equal Rights Legislation for Adjunct Professors" in The Adjunct Advocate. The AFT maintains a state-by-state database, FACE (Faculty and College Excellence), with "an emphasis on legislation designed to improve the working conditions of contingent faculty." The email list adj-l has been a consistent platform for discussing issues impacting contingent faculty. It is an open (unmoderated) list that promotes constructive conversations.